Non-Hodgkin lymphoma is a cancer that starts in cells called lymphocytes when abnormal cell start to reproduce rapidly. 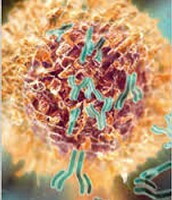 Lymphocytes are part of the body’s immune system. 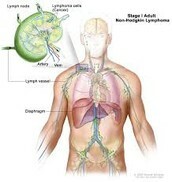 Lymphocytes are in the lymph nodes and other lymphoid tissues (such as the spleen and bone marrow). Kills cells that are growing or multiplying too quickly. Helps bone marrow produce new blood cells. 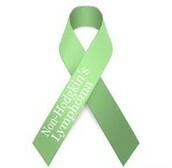 About 71,000 patients will be diagnosed with NHL in 2015, and approximately 19,500 patients will die of NHL in the U.S. Specializes in diagnosing blood disorders. Uses images to diagnose and treat disease within the body. Applies radioactive substances to diagnose and treat disease. Treats and manages cancer by prescribing radiation therapy. -In the United States, whites are more likely than African aAmericans and Asian Americans to develop non-Hodgkin lymphoma. Also In the United States, whites are more likely than African Americans and Asian Americans to develop non-Hodgkin lymphoma. 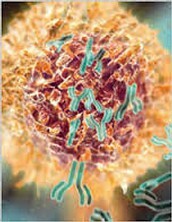 The most distinctive way that non-Hodgkin lymphoma affects the body is by the overproduction of lymphocytes causing the build-up of tumors and the swelling of lymph nodes in the affected regions of the body.Also other parts of the body may experience build-up of cancerous lymphocyte tumors as well. HEREDITY-Some people inherit DNA mutations from a parent that increase their risk for some types of cancer. But non-Hodgkin lymphoma is not one of the cancer types often caused by these inherited mutations. AGE-Getting older is a strong risk factor for lymphoma overall, with most cases occurring in people in their 60s or older.